When you have twins or two children close in age, you need a double stroller. Whether for strolls through the neighborhood, visits to the park, running errands or travel, a double stroller is a necessity. Double strollers are usually bulky and heavy in design to accommodate 2 children. They often lack storage, are difficult to maneuver, and hard to lug around. Today’s double strollers are designed for comfort and convenience. They are built with lighter weight frames and narrow designs to make travel easier. Suspension wheels absorb shock for a smoother ride and aid in maneuverability. A double stroller is an investment and should be able to grow with your children. A good quality, good function, and convenient double stroller is an investment and should be the best. 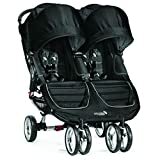 An affordable and dependable double stroller, Graco’s Duo Glider Click Connect is a good investment. The front and rear seats each can be used with infant seats. Graco’s Click Connect system makes attachable infant seats easy. As your babies get older, the seats both recline and have individual canopies and footrests. The rear seat reclines fully flat. Graco’s 1 hand folding mechanism leaves a free hand for baby. The stroller stands alone when folded. The all-terrain wheels have suspension for a comfortable ride. The stroller is easy to maneuver. Added features include a parent tray with storage for keys and phone, 2 deep cup holders, and an easy to access drop-down storage basket. This is a great price for a great stroller. Baby Trend’s Sit N Stand stroller accepts 2 infant car seats and the rear seat can be removed for an older child to stand safely. This is great for twins, 2 children close in age, or an infant and older child. The stroller is affordable. It has a stylish look and functions well with easy maneuverability. There are canopies, a swing away and removable child tray with a cup holder in the front, a parent tray with cup holders, and a large storage basket. This is a great adjustable stroller for 2 small children. 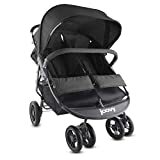 Joovy’s Scooter X2 is a good double jogging stroller. The stroller is compact and lightweight with a double stroller. The side-by-side seats fit easily through a standard 30 inch door. The stroller can fit through most doorways and easily through the grocery check out aisle. The sturdy stroller holds up to 90 pounds so it will grow with your babies. The seats recline separately, and there is a large canopy for ample protection from the elements. The Joovy Scooter X2 folds easily using just 1 hand and folds compactly to fit in the car trunk. Features include a removable bumper bar, a belly bar, a large storage basket, and 2 parent cup holders as well as zippered pockets for safe storage of keys and phone. The Joovy Caboose includes a rear bench seat that can be removed for an older child to safely stand on the platform. This double stroller grows with your children. It comes with a Universal Car Seat Adapter that fits most major brand infant seats. The front seat reclines to 3 positions and a sun canopy. The stroller holds up to 90 pounds and will grow with your children. The ride is comfortable and the stroller is easy to maneuver. Zoe’s Umbrella stroller is great for families on the go. It is lightweight, weighing just 16 pounds. It folds quickly and compactly. Unusual for an umbrella stroller, the Zoe XL2 has a large storage basket, convenient for travel. There is also a safe storage pocket. The seats recline a deep 135 degrees. Separate 4 paneled sunshades have peek-a-boo windows. Other features include 2 child cup holders and a padded front belly bar to protect your older babies. 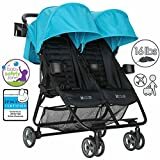 The Citi Mini by Baby Jogger is an excellent double jogging stroller. It is well worth the investment for someone with twins or 2 children close in age. It is great for urban living. The jogging stroller features .5 inch all-terrain wheels with front wheel suspension for a smooth ride. The seats are plush, padded and have a vented seat top for babies’ ultimate comfort. They recline to near flat positions. There are 2 large separate canopies to protect babies from the sun. The handlebars are adjustable for the comfort of the jogger. The Citi Mini features Baby Jogger’s patented 1 hand fold and folds compactly. The double jogging stroller is lightweight yet sturdy, holding up to 100 pounds. 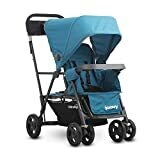 It is a great stroller for joggers and for maneuvering through the city. Chicco’s Cortine Together is a front and rear seat double stroller that is roomy, yet folds compactly. It fits both Chicco Key Fit and Key Fit 30 infant car seats. Thee back seat reclines to 3 positions for an infant or small baby’s comfort. The front seat can be folded forward to attach an infant seat. The sleek aluminum frame makes this a lightweight double stroller. The Chicco Cortine features canopies, cup holders and an ample and accessible storage basket. 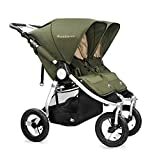 Although more expensive than most, the Bubbleride Indie Twin is a top of the line stroller that is worth the investment. 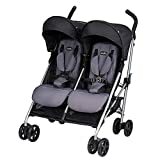 This double jogging stroller is sleekly designed with durable, quality and eco-friendly materials. The all-terrain jogging stroller is easy to maneuver and lightweight. Its narrow side-by-side design is unique and this stroller can fit through just about any door. The stroller holds up to 90 pounds so it will grow with your twins. There are 2 separate canopies and adjustable seats. The stroller comes with 2 “Carrycots” or bassinets with zip covers and ergonomic mattress pads. Evenflow’s Minno Twin umbrella stroller is moderately priced, sturdy and convenient. It is a lightweight double umbrella stroller that folds up compactly for easy travel. The seats recline in multi-positions and the footrest has 2 positions. There is a large canopy with an extended visor. Uncommon in umbrella strollers, the Evenflo Minno features a large storage basket with rear access. The handlebars are angled and comfortable to push. The stroller weighs just 26 pounds and is only 27 inches wide. The stroller folds with just 1 hand and stands alone, uncommon for an umbrella stroller. The stroller seats up to 90 pounds so it will grow with your baby. The Delta Children LX Side by Side double stroller is affordable and loaded with convenient features. The frame is lightweight and this umbrella stroller is easy to fold. It also has a padded shoulder strap for traveling comfort. The seats recline to multiple positions. The design is sleek and the double umbrella stroller easily fits through a 30 inch doorway. Features of this stroller include a parent cup holder, 2 large hanging storage bags, and large European style canopies. This is an affordable, quality umbrella stroller 2. Finding a double stroller can be a difficult task. 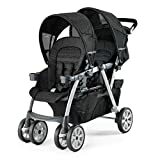 However, 2019 offers several quality made double strollers that are lightweight, have storage and are easy to travel with. These strollers are unique in design and make traveling with 2 babies convenient. 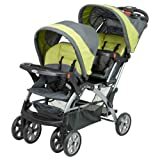 Whether you are looking for a double jogging stroller, a double umbrella stroller, or a standard double stroller, you are sure to find the right one for you.